I'm waving. I'm yelling what I had heard another astronaut say moments before when the Atlas rocket carrying Glenn and his capsule, Friendship 7, blasted off in an eruption of smoke and flame toward its goal, 200 miles above the Earth. That man I admired so much as a child and grew to respect so much as a political figure when I became an adult and a political journalist left us Thursday, passing away at the age of 95 at the James Cancer Hospital in Columbus, where he had been hospitalized for over a week. John Herschel Glenn Jr. lived a life so full, so significant, so full of accomplishment that it is hard to believe now such a man existed. But he did; and he changed millions of lives forever – as an astronaut, as an advocate for space exploration, as a loving father and husband to Annie, as a politician who served 24 years in the U.S. Senate representing his beloved state of Ohio, and as a man who once felt the call to run for the presidency. I have covered politics for 42 years. I have known literally thousands of political people – men and women, Democratic and Republican, conservative and liberal. Most of them I would call honorable people who wanted to do the right thing. But I have never known one to match John Glenn for kindness, for thoughtfulness, for humility and a belief that he would treat everyone with decency and respect. It was 1974. I was 21 years old. My senior year at Ohio University. I was a reporter for The Post, the daily student newspaper on campus and I had claimed the job of politics reporter for my own. That year, there were two major races to cover in Ohio – the governor's race, which pitted the Democratic incumbent, John Gilligan of Cincinnati, against the Republican, former governor Jim Rhodes. And a U.S. Senate race in which Glenn faced Republican Ralph Perk, the mayor of Cleveland. I was at a Glenn campaign event in Columbus and I asked the campaign staff for an interview with the candidate. There was a little hub-bub among the staff – after all, I was this long-haired, hippy-looking kid from Athens writing for a student newspaper and they weren't sure they needed to waste time with me. But, in the end, they did. Ten minutes; that's all you get. Howard Wilkinson speaking with John Glenn. I walked into a holding room for the candidate; and there sat John Glenn. My knees were knocking. This was my boyhood hero. But I had to act like a professional journalist. I was a nervous wreck. Glenn immediately set me at ease. "So, where are you from?,'' he said. Dayton, I answered. He perked up at the mention of the "Birthplace of Aviation" and that set off a discussion of Wright-Patterson Air Force Base and Dayton's most famous sons, Orville and Wilbur Wright. It ended up being a 45-minute interview on a wide range of subjects. The man did not treat me as some dumb college kid. He treated me as if I were writing for The Washington Post or The New York Times. Thus began several decades of me covering Glenn in his various campaigns for the Senate. In 1984, I traveled with him and his beloved wife Annie in New Hampshire in his ill-fated bid for the Democratic presidential nomination. And I admit that it was painful watching his campaign fall apart in the Granite State before my very eyes. In the year 2000, Glenn published his memoirs. He did a book tour that took him to a book store near my mother's home in Dayton. She knew all about my relationship with Glenn; and she took a bus to the shopping center and went to the book store to stand in line for an autographed copy of the book. When she got to the table where Glenn was signing, she couldn’t help herself and blurted out that "you know my son, Howard Wilkinson; he writes for the Cincinnati Enquirer." "You're son is a good man, a great reporter,'' he told her. "What's your name? Norma? OK, Norma, I want to give you a special inscription." "Dear Norma, You must be a great mother to raise a son as good as Howard! 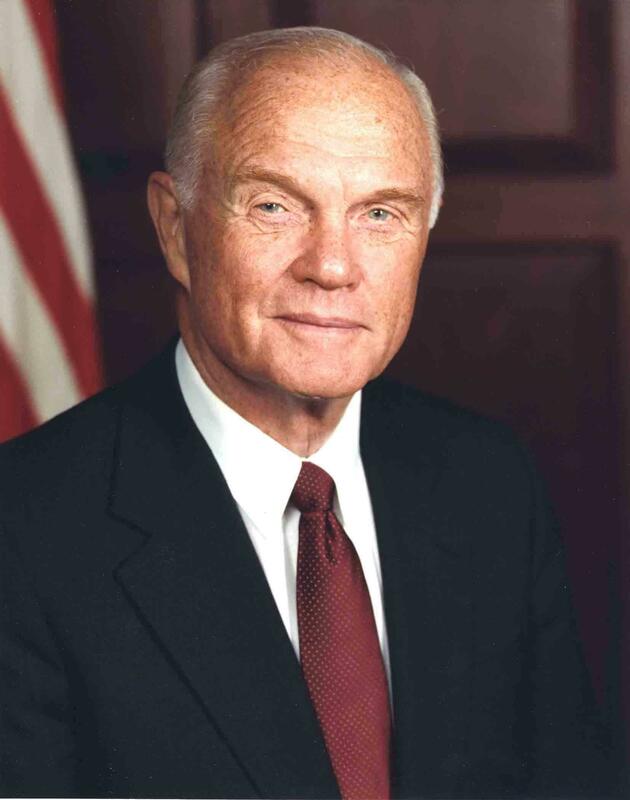 Best wishes, John Glenn." She was thrilled. She showed that book to every person she knew. She showed it to a whole lot of people she didn't know. And when she passed away, I inherited the book. So who was this man I admired so much as a child and whom I had to write about objectively as an adult? What happened on February 20, 1962 was but six hours out of a long and eventful life that spanned nearly 10 decades. But it led him from a boyhood in the tiny Muskingum County village of New Concord to a ticker tape parade down Broadway in Manhattan, the street lined with hundreds of thousands of Americans enthralled by the man and his accomplishment. But, as he told me on the 40th anniversary of his orbital flight in that tiny Mercury capsule (he and his fellow Mercury astronauts referred to themselves as "Spam in a can"), it was six hours that was with him every moment of his life thereafter. "It's a rare day I don't think about it, relive it in my mind,'' Glenn told me in 2002. "I can remember every switch I flipped, every move I made, every word I spoke and every word spoken to me. Clear as a bell." What he had done in those six hours was astounding for the time – circling the Earth at an altitude of 200 miles and at a speed of 17,000 miles per hour. But he had to wait an excruciatingly long time for it to happen. His flight in his Mercury capsule, which he named "Friendship 7 in honor of his fellow Mercury astronauts, had been scrubbed 10 times before the early morning hours of Feb. 20, 1962 for a variety of reasons, including weather conditions and mechanical problems. But, by 8 a.m. that morning, the skies over Cape Canaveral had broken up enough to give mission control a flight window. The Atlas rocket lifted off and a voice crackled over the speakers from mission control. "Godspeed, John Glenn," Mercury astronaut Scott Carpenter said to his friend as the Atlas rocket raced through the atmosphere and into the blackness of space. It was not an easy flight. After the first orbit, the capsule's automatic control system malfunctioned, forcing Glenn to spend most of the next two orbits on manual control. As he passed over Australia, he looked down and saw a bright light below – it was the city of Perth, where every person in town had turned on their electric lights as a sign and a gesture of good will to the man hurtling through space above them. Then, Glenn skirted with disaster. A warning light came on in the capsule telling the astronaut that the capsule's heat shield was loose. It meant that Friendship 7 could possibly burn up while re-entering the Earth's atmosphere. Mission control told Glenn to keep the capsule's retro rocket pack attached during re-entry, in hopes that it would keep the heat shield in place. The heat was tremendous; the capsule appeared to be a fireball as it descended into the atmosphere. But the heat shield held; and Glenn landed safely. The audio of Glenn talking to mission control on re-entry sounded like a man calm, cool and collected, without a hint of anxiety or fear. An astronaut with "the right stuff." Danger was, by that time, no stranger to John Glenn. He was a fighter pilot in both World War II and Korea, flying 149 combat missions. In Korea, he flew with baseball Hall of Famer Ted Williams. 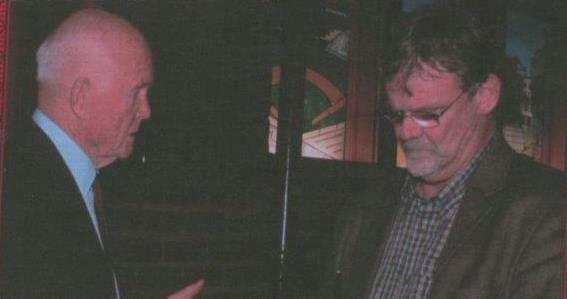 Years later, Williams, a conservative Republican, said that he couldn't believe a guy as good as Glenn was a Democrat. The senator got a laugh out of that. On February 20, 1997, I went back to Glenn's home town of New Concord for an announcement at Muskingum College – the four-term senator said he would not run for re-election in 1998, "saying there is no cure for the common birthday." But he astonished the world in 1998 when, at the age of 77, he returned to space as a member of the crew of the space shuttle Discovery. He spent nine days on board Discovery, compared to only six hours in Friendship 7. NASA created a series of geriatric-reaction experiments to create a scientific purpose for Glenn being on board. And Glenn had a point to make – that age is no barrier to chasing your dreams. Glenn chased his for all of his long life, from his formative years in New Concord to the John Glenn School of Public Affairs at The Ohio State University. John Glenn did it all. And he will never be forgotten. We'll still look up at the sky on a starry night and whisper to ourselves, Godspeed John Glenn.